There’s no doubt that feasting on fresh fish is a year-round affair. Did you know that seafood tastes even better and is more filling during the winter season? Many different seafood species are in their absolute prime during the winter months, apart from a select few shellfish such as mussels, which spawn and lose a lot of their mass in winter. Though it may seem a little unusual, the cold of winter actually provides ideal conditions for producing fresh, healthy seafood. The water is cold, and the different varieties of fish and seafood have a higher fat content, which produces a tastier, healthier end product. Being a rich source of omega-3 fats helps in keeping the winter blues away. In fact, medical experts are recommending a greater intake of seafood, as it contains potent levels of omega-3 fats not found from any alternative sources like vegetables and walnuts. The cool air temperatures help keep fish and seafood fresher for longer – whether while it’s being sorted on the deck of the boat, in transit, or being processed at fish markets and shops ready for sale. Instead of battling against temperatures in the high 20’s and 30’s, winter ensures that the temperature drops substantially. This means fridges and chillers work better, and the cold chain is easier to maintain. With these ideal conditions, you can be assured that the quality seafood you purchase from fish markets will remain fresh and tasty for a longer time. Perhaps Oysters are the best example of seafood that’s better purchased during winter. Oysters often spawn during the warm summer months, causing them to become soft and less flavourful. When shucked in the colder months of winter, Oysters tend to have a firmer texture and a bright briny flavour. Take a look at these fantastic winter Pacific Oysters (in the above image), grown in Franklin Harbour, South Australia by Turners Oyster Farm. Having just been crowned as the ‘Best Commercial Oyster” at The SA Oyster Growers Association Awards, we consider ourselves privileged each and every time we get a shipment of live Oysters from the guys at Turners. 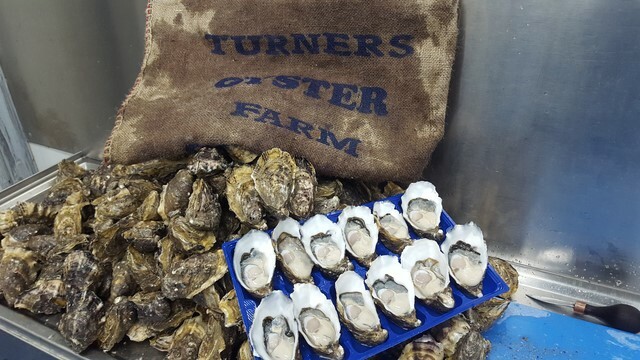 Turners Oyster Farm produces an outstanding product all year round – there is absolutely no doubt about that. You simply can’t beat a feed of their winter Oysters if you really want to experience the epitome of deliciousness.